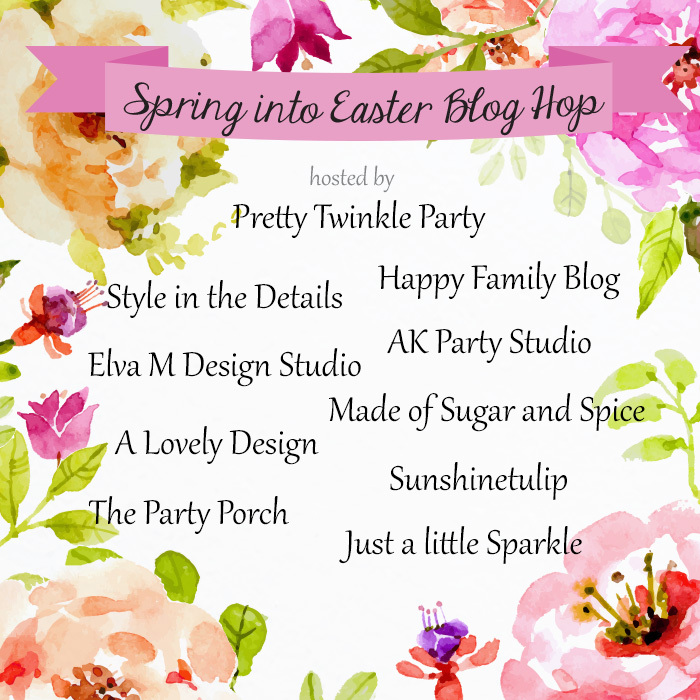 I have teamed up with nine fabulous bloggers to inspire you to Spring into Easter. If you are joining me from the very talented Happy Family Blog, welcome, I am so glad you are here. We are going to have so much fun, so let's get hopping along! I am sharing a simple and affordable Easter dessert bar cart that is easy to set up whether you are celebrating indoors or outdoors. The great thing about bar carts is there ability to move wherever the party goes! Flowers bring so much life and personality to any event, whether big or small. I try to make sure I always include some sort of greenery or flowers. I love mixing and matching and creating my own arrangements for what style I am looking for. Grab a couple bouquets from your local grocery store. Arrange into a pretty vase, that you may already have at home, and they will brighten up any space. Sometimes I like to do elaborate things and other times I want to keep it simple. When you are short on time, try doctoring up a boxed cake mix. It is super easy and there are so many ways it can be done. I always add Jello to mine and they turn out delicious. They taste a little more homemade, but work really well when in a hurry. Add a few candies to the top of any cupcake, and you have a fun and tasty treat! I don't know about you, but these little chocolate eggs are my absolute weakness. It's like they speak to me, I definitely can't eat just one. As much as I love seeing them hit the store shelves, I am certainly happy when they disappear for awhile, or at least my waist line is! Sweet pink lemonade makes for a refreshing drink, add a little sparking wine for the adults and you have something perfectly delicious. This gal loves using paper products. The clean up is a breeze and lets face it, after spending your day prepping food, decorating and cleaning your house the last thing I want to do after a party is dishes! So, do yourself a favor, find a cute set of paper ware that goes with your party, you will thank me later! I found these darling beauties at Home Goods, I just love them. What is your trick for easy entertaining? I would love to hear it! Thanks for celebrating with me today! To keep following along on our blog hop head over to Made of Sugar and Spice for more fabulous Easter inspiration! Love your setup! I have not taken my bar cart outside yet, but I think it is time!!! Thank you for the inspiration! You totally should! It is such an easy way to entertain outside. This is so pretty! I love how elegant it all looks! So beautiful, I love all the colors you used to style your bar cart. How cute are the bowl of eggs and those plates. So adorable. Thanks for sharing! Those eggs were a steal of a find last year, love them! Thanks for hopping by! Darling bar cart Toni! Those chocolate eggs are my favorite! I love the new site. Looks awesome. You did a great job! I know, maybe I should buy stock in them! Thanks for the kind words. This is such a beautiful set up! The gilded eggs are adorable! The bar cart is breathtaking. Love the soft touches with the fabric and the pretty pastels. Tell me more about jello in the cake mix. I've never heard that trick! Thank you! The jello trick is fantastic! I use a Jenny Cookies recipe from her book. It is a small box of the jello instant pudding/pie filling. Super moist and yummy. This is simply divine! Love the elegant and simple touches! Now I'm inspired to take my cart outside too! Thank you!